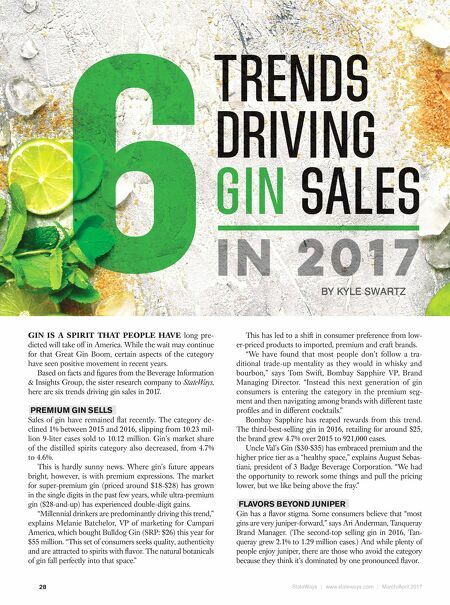 StateWays | www.stateways.com | March/April 2017 28 6 TRENDS DRIVING GIN SALES BY KYLE SWARTZ IN 2017 GIN IS A SPIRIT THAT PEOPLE HAVE long pre- dicted will take off in America. While the wait may continue for that Great Gin Boom, certain aspects of the category have seen positive movement in recent years. Based on facts and fi gures from the Beverage Information & Insights Group, the sister research company to StateWays, here are six trends driving gin sales in 2017. PREMIUM GIN SELLS Sales of gin have remained fl at recently. The category de- clined 1% between 2015 and 2016, slipping from 10.23 mil- lion 9-liter cases sold to 10.12 million. Gin's market share of the distilled spirits category also decreased, from 4.7% to 4.6%. This is hardly sunny news. Where gin's future appears bright, however, is with premium expressions. The market for super-premium gin (priced around $18-$28) has grown in the single digits in the past few years, while ultra-premium gin ($28-and-up) has experienced double-digit gains. "Millennial drinkers are predominantly driving this trend," explains Melanie Batchelor, VP of marketing for Campari America, which bought Bulldog Gin (SRP: $26) this year for $55 million. "This set of consumers seeks quality, authenticity and are attracted to spirits with fl avor. The natural botanicals of gin fall perfectly into that space." This has led to a shift in consumer preference from low- er-priced products to imported, premium and craft brands. "We have found that most people don't follow a tra- ditional trade-up mentality as they would in whisky and bourbon," says Tom Swift, Bombay Sapphire VP, Brand Managing Director. 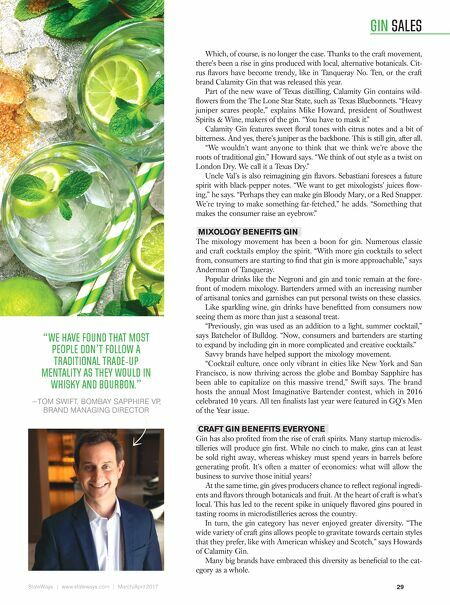 "Instead this next generation of gin consumers is entering the category in the premium seg- ment and then navigating among brands with different taste profi les and in different cocktails." Bombay Sapphire has reaped rewards from this trend. The third-best-selling gin in 2016, retailing for around $25, the brand grew 4.7% over 2015 to 921,000 cases. Uncle Val's Gin ($30-$35) has embraced premium and the higher price tier as a "healthy space," explains August Sebas- tiani, president of 3 Badge Beverage Corporation. "We had the opportunity to rework some things and pull the pricing lower, but we like being above the fray." FLAVORS BEYOND JUNIPER Gin has a fl avor stigma. Some consumers believe that "most gins are very juniper-forward," says Ari Anderman, Tanqueray Brand Manager. (The second-top selling gin in 2016, Tan- queray grew 2.1% to 1.29 million cases.) And while plenty of people enjoy juniper, there are those who avoid the category because they think it's dominated by one pronounced fl avor.